Available as either a 400mm or 800mm wide unit, the new FriFri electric griddle features a high specification, flat bar element. 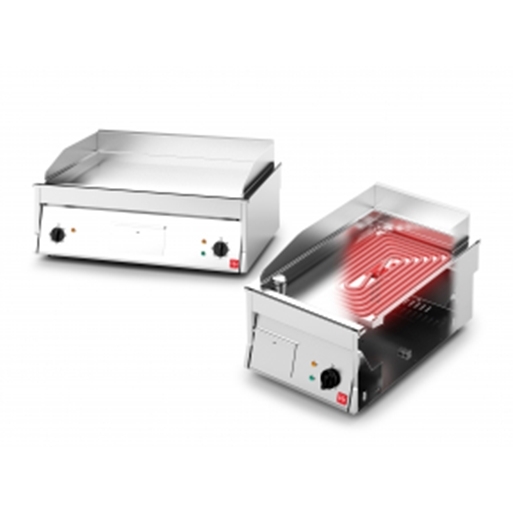 This transfers heat efficiently to the griddle plate, and its low power density ensures longevity. The new griddle is equipped with precise thermostatic control up to 275oC for consistent results and economical operation. The 15mm thick chromed griddle plate is easy to clean and provides reduced heat radiation for a more comfortable working environment and reduced energy costs. A sunken well and plug allow for shallow frying and facilitate cleaning, whilst a splash back is provided to prevent oil splashing onto neighbouring surfaces. Attractively styled and robustly constructed from 304 grade stainless steel, the new FriFri griddle is perfect for front of house, theatre-style cooking. It can be used on the counter top. Alternatively, a stand with a cupboard is available as an option. When sold in the UK, it is supplied with a comprehensive two-year parts and labour warranty. The FriFri range comprises free-standing, built-in and counter-top fryers, all manufactured to the very highest standards in a number of power and voltage variants. The range also includes chip scuttles, pasta cookers and high efficiency gas fryers. FriFri is manufactured at Middleby’s centre of manufacturing excellence at Lincat’s factory in Lincoln, in the UK, where the majority of FriFri products and components are also held in stock and carry a comprehensive two-year parts warranty.